Are you thinking about buying an RV at auction or from a private party? Worried about your RV breaking down during your next big trip? Have your RV inspected by Apache RV and enjoy a little piece of mind in knowing that your next adventure, whether it be a family outing or potential purchase, will be trouble free. 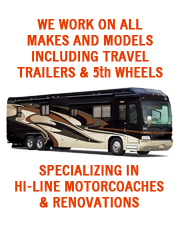 *Actual cost of RV Inspection is based upon individual coach specifications.